Then she made...: I want my mummy! The kiddos are out of school for a good portion of this week so it's time to do some quick and easy crafting. Here's what the Bug and I did today... we made mummies! Want to make your own? 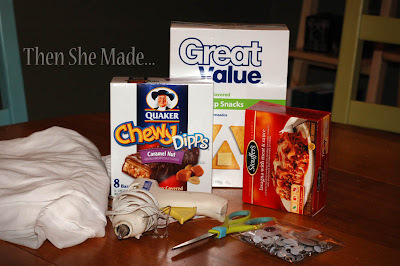 They are soooooo easy and super cheap! - Start by putting your boxes back into box form - mine were collapsed for recycling. Then set aside. - Tear sheet or fabric into strips. You can cut them but the torn edges look more mummy-ish (yes, I made that word up!) 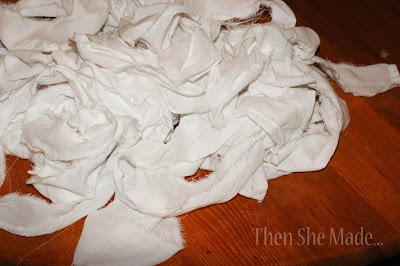 You won't need the full sheet but tear a pretty good sized pile just for good measure. - Now it's time to start wrapping the box. Simply add a dot of glue to the place you want to start, then adhere the fabric in place and wrap. Once you are at the end of that fabric strip add another glue dot to hold it in place and then start the process over until the box is completely wrapped. - Once the box is wrapped, add your googly eyes. - and now the next step is to display them. Super cute idea! I am on a mummy fetish this Halloween but have found no fun ideas to make any.....until now. :) Thanks! Very cute! I need something for my front porch, and these just may be the ticket. These are adorable ! Quelle bonne idée, merci. Love this! I'll be doing this with the kids tonight - I hope! I have just subscribed to your blog! So cute and a new idea. Saw the link on Crafty Crow and had to come over. I made with one of my young 3 yr. olds. Googly eyes are always a hit, but tearing up the old fabric had him laughing. We cut down a large box to get a smaller mummy and wrapped fabric the long way first to cover our ends. Wish I could post a photo here for you to see. Will go good with our stuffed jack-o-lanterns. I'll be linking to your post when I post on http://countryfun.edublogs.org about our activities this week. 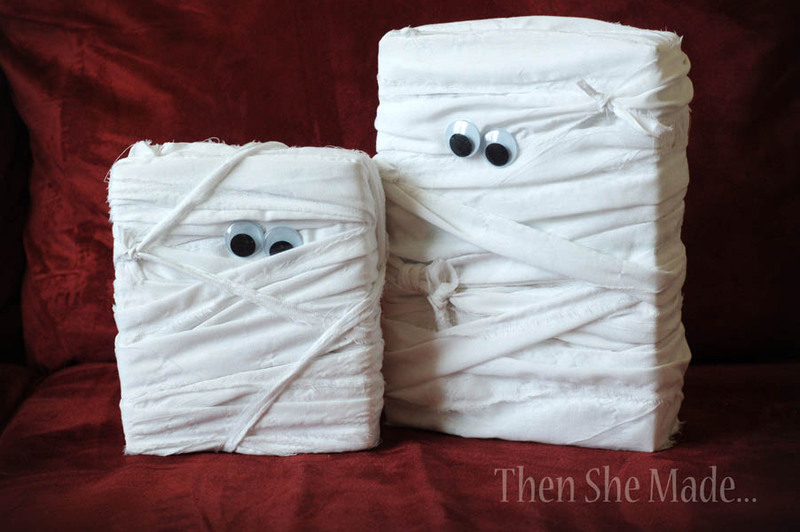 I made my own set of mummies! I love this idea! Thanks for sharing!